Assistant Professor, Faculty Affiliate, Women's, Gender and Sexuality Studies. 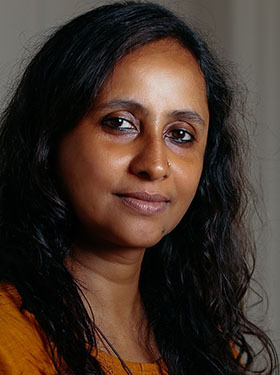 Interests: Labor, gender, politics of development, South Asia, creative methodologies. Current Research: My interests are in the everyday politics of labor, life stories of workers, women and work. Nowak J, Dutta M, and Birke P (eds). 2018. Workers' Movements and Strikes in the Twenty-First Century: A Global Perspective. Rowman & Littlefield International. Dutta, M. 2019. ‘Becoming’ factory workers: understanding women’s geographies of work through life stories in Tamil Nadu, India, Gender, Place & Culture. Dutta, M. 2016. Place of life stories in labour geography: why does it matter? Geoforum, Vol. 77, 1-4. Dutta, M. 2016. The Nokia SEZ Story: Economy of disappearances. Economic & Political Weekly. Vol. L1 (51), 43-51. Good Land: Bad Bank - Deadlocking valuable land in unproductive industrial land banks in India. January 2019. Ph.D., 2016, Geography, University of Durham, UK. M.Sc.,1994, Environmental Science, Jiwaji University, Gwalior, Madhya Pradesh, India. B.Sc.,1992, Delhi University, Delhi, India.